At EA PLAY, we revealed a slew of Battlefield™ 1 news. 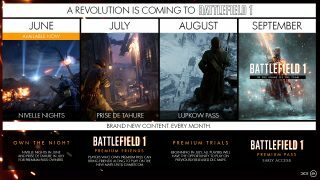 Later in June, owners of Battlefield 1 Premium Pass or Battlefield 1 They Shall Not Pass will get access to the Nivelle Nights map, followed by the Prise de Tahure map in July. On the back of the release of Prise de Tahure, we’ll begin Premium Trials. When active, Premium Trials will give all players access to maps exclusive to Battlefield 1 Premium Pass owners. Furthermore, Premium Friends will be available until Gamescom. Premium Friends lets Premium Pass owners bring their friends in to play on the new maps their friends normally can’t access. In August, Lupkow Pass will be the first map we release from Battlefield 1 In the Name of the Tsar – the most extensive Battlefield expansion pack so far. The map will then be followed by the entirety of the expansion pack in September. The third expansion pack, Turning Tides, will be released in December 2017, followed by Apocalypse in early 2018. We’re very excited to bring a competitive experience to the 20 million players of Battlefield 1 and can’t wait to share more with you, our community, at Gamescom in August. The CTE (Community Test Environment) will be available on consoles soon. The CTE is a Battlefield 1 environment where involved players can help us test new features, improved/changed content, and experiments that aren’t yet (and may never be) ready for public release. 2XP event: Get double XP between June 10 – 11 to rank up faster. Scraps giveaway: Earn 50 extra Scraps each day you login between June 10 – 11. Battlepack giveaway: Login between June 10 – 11 and get a free Battlepack. “Call to Action” mission: Play, complete, and win 3 matches of Operations between June 10 and June 18. The “Bronze” Dog Tag and a Squad XP Boost await those who succeed. And yes, this is only the beginning. Stay tuned for more updates.